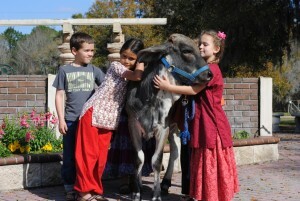 We have been caring for cows and oxen for the past 30 years here at the Alachua Hare Krishna Temple. 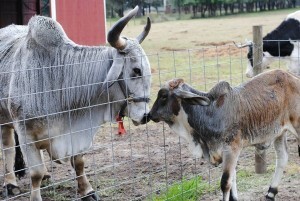 Our animals are lovingly cared for and allowed to live out their natural life. Sometimes local people call and ask us to take over the care of a beloved pet cow or steer, or we hear about an animal that has lived a sad existence in a huge dairy, forced to calve every year without ever having a chance to be with her baby and we bring her here to live a nice life. It costs approximately $20,000 for us to purchase a new cow and take care of her for the next 20 years. Most people cannot afford to buy a “new cow”, but you might be able to adopt her. Your donation will go into a savings account for your cow, or you might choose to commit to a monthly payment towards her care. Hay, grains, veterinarian fees, milking equipment, keeping up her Goshala, even treats; these are just some of the things your donation will go for. 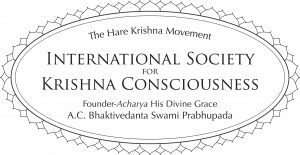 Protection of cows is the single-most important principle towards saving the whole world from both moral and spiritual degradation. Simply by protection of cows all the wonderful benefits of religiosity and piety will be automatically achieved without any separate endeavor. 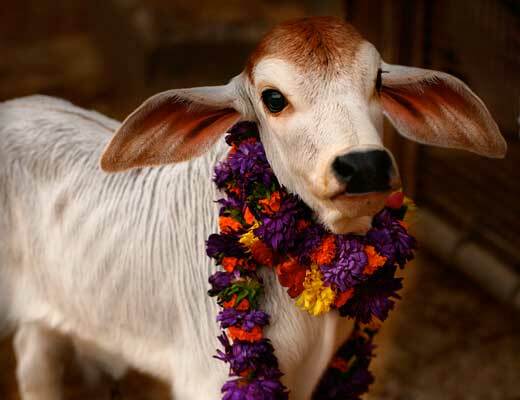 This is because cows are as beloved to the Supreme Personality of Godhead, Lord Krishna, as even saintly brahmanas. Cow Guardians make a monthly contribution to our Cow Protection Florida program, and every penny donated is used for the benefit of the cows. $101 is roughly the cost of feeding and caring for one cow per month (our cows have cowherds, whose lives are dedicated cent percent to the loving care of our animals, and they have to be taken care of also). No amount is too small (or too big!) Every donation counts! We have built a nice new Goshala barn for our cows and bulls. Here our cows are milked and can get away from the elements. It is specially designed so that classes of school children can look in and see cow care in action, and we can offer classes in preparing milk products. Your donations will help us maintain the program, and maintenance is always crucial.